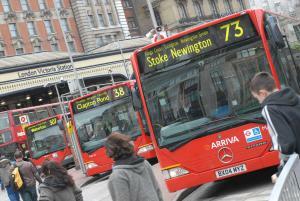 London Bus Riders Can Tap Bank Cards to Pay Fares; NFC Acceptance Unlikely for Now | NFC Times – Near Field Communication and all contactless technology. Transport for London has launched its much-anticipated service enabling riders to pay fares onboard buses by tapping their bank cards. The more challenging phase two, which will expand payment to the London Underground, is scheduled to launch next year. As earlier reported, the launch of the service–while delayed from its planned unveiling during the Summer Olympics and only in its first phase–still makes London the first major city anywhere to allow riders to directly pay their fares with open-loop bank cards. Article has about 1480 words.